Any discussion of Oxford shoegazers Swervedriver almost invariably begins with 1991′s Raise and ends with 1993′s Mezcal Head. But if their next two albums — 1995′s Ejector Seat Reservation and 1998′s 99th Dream — are overlooked, it’s not the band’s fault. The late ’90s were a no man’s land for shoegaze — most of the first wave (My Bloody Valentine, Ride, Lush) had broken up, while many of its other major players (Catherine Wheel, The Boo Radleys) had mostly abandoned the hazy layers of guitars and effects in favor of an approach that favored more overt pop songwriting, Britpop aesthetics and crisper production. That change in landscape might not have been as much of an issue had Swervedriver not been fighting off their own label-related troubles, which began with their loss of support from A&M — preventing Ejector Seat Reservation from being distributed in the United States — was further complicated by a contract with Geffen that was terminated before they ever released an album, and concluded with eventual realization that keeping the band alive just wasn’t fun anymore. While “Deep Wound” took 15 years to arrive after the band’s unceremonious end, it only took a little more than one year for a full-length album to follow. Tempting as it is to say that it sounds like no time has passed at all since the band stepped off the stage in the late ’90s, the passage of time is apparent, not just in Franklin’s voice — which sounds slightly more weathered than during the band’s heyday — but in the intricate and dreamy compositions of the album. 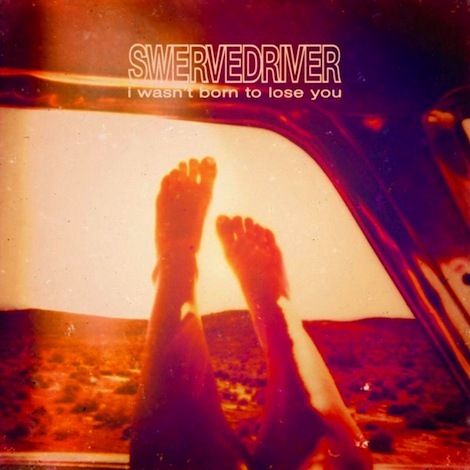 I Wasn’t Born to Lose You isn’t so much a continuation of the more acoustic-heavy dream pop of 99th Dream nor the more aggressive drive of Mezcal Head so much as a proper 21st century update of Swervedriver’s singular aesthetic. It’s not shoegaze in the classic sense, but then again, Swervedriver were always more likely to trace the fringes of the genre. Still, it’s hard not to hear a bit of the past hanging over Franklin as he croons, “Time will heal all exit wounds,” in the opening of “For a Day Like Tomorrow.” But if Swervedriver didn’t get the chance to close their legacy properly the first time, this is a fine way to present a second act. There’s less aggression, but still as much intensity to their self-coined “space travel rock ‘n’ roll.” The pounding “Everso” sounds continuously on the verge of a climax, but it continues to chase the horizon, its whirring background feedback and driving melody keeping it in a state of awe-inspiring stasis. And the sludgy, stoner-rock groove of “Red Queen Arms Race” is the heaviest the band has sounded in a long time, which is saying a lot considering the greatest characteristic differentiating them from their early ’90s peers was their itch to rock that much harder. Still, it’s in the euphoric arpeggios of “Autodidact” that Swervedriver sound their strongest, and while it’s refreshing to know that the band is still capable of rocking hard after a few decades, it’s what else they do here that’s most interesting. I Wasn’t Born to Lose You is more grounded than cleared for launch, and more frequently has its gaze at eye level than toward a pedal board. There’s a lot to like about this album, but the band’s greatest victory of all is having traveled so far without having lost any of their potency.